Stage Door Theatre opened Jim Brochu's Character Man on July 12, 2013. Robert Bartley direct Jim Brochu in his one-man show. Character Man is a delightful, extremely well-crafted, Off-Broadway theater piece that is destined for a run that might rival his critically-acclaimed one-man Zero Mostel tribute show, Zero Hour, which played throughout the country between 2006-2012 and earned Brochu 2010 Drama Desk and Helen Hayes Awards. In this tour-de-force performance, Brochu honors all the other great musical theater actors, many of them unsung, who he idolized from his teenage years through his adulthood, including Jack Gilford, Jackie Gleason, Robert Preston, George S. Irving, Cyril Richard, Phil Silvers, Barney Martin, Bert Lahr, Lou Jacobi, Charles Nelson Reilly, and most of all, his mentor David Burns, who is almost the star of this show. While a few of these versatile singer/actors, like Mostel, Preston, Gleason, and Richard, did shine in starring roles, for the most part they were all the solid supporting structures upon which some of the greatest Broadway musicals were built. While there are only 11 songs (besides the opening number), they are so rich and well-delivered, it seems like more. (Brochu's original Musical Director John Fischer wrote the arrangements.) Brochu is a fine raconteur and the show is deeply personal without being self-indulgent, while his self-deprecating humor is revelatory and charming. The balance of script to songs and the tone of the show is almost perfect, and the photo presentation of the character men (some with Brochu in the shots) adds depth to the stories and isn't overdone. ...anyone who sees this triumphant show from an incredibly accomplished performer will certainly be changed for good. 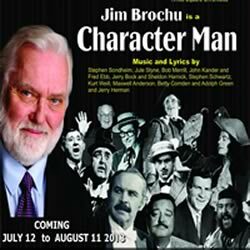 If you’ve dreamed of sitting in the upstairs bar of Sardi’s to hear journeymen trade war stories about Broadway’s past, you can get a taste at Jim Brochu’s new one-man show, Character Man. The veteran New York actor-playwright, who triumphed in 2009 with Zero Hour, spends a couple of acts at Broward Stage Door recollecting his meetings with famous and not-as-famous stalwarts from Jackie Gleason to Jack Gilford, Zero Mostel to David Burns. Compared to his volcanic recreation of Mostel in Zero Hour, Brochu is a gentle giant exuding a reserved gusto and a quiet charm. He’s learned from his heroes how to hold a stage without chewing the scenery. With a few exceptions, he stands still center stage, perhaps waving arms for emphasis or doing a couple of off-hand dance steps, but that’s it. The entire show is enhanced with evocative productions photos, personal snapshots and headshots of these performers projected on screens on either side of the stage — plus a weird home movie with unintelligible sound depicting a party at Charles Nelson Reilly’s home in Los Angeles. Brochu is ably accompanied by Stage Door stalwarts David Nagy on piano and Rupert Ziawinski on bass. They add their voices as well, standing in for the townspeople’s chorus in “Trouble “from The Music Man and or the pirate band in Cyril Ritchard’s “Capt. Hook’s Waltz” from Peter Pan. The Miami Herald declined to review this production. The Sun-Sentinel doesn't employ a theatre reviewer. Character Man plays at the Broward Stage Door Theatre through August 11, 2013.